I’m now halfway through my final season with Fiorentina, and we’re well on course to have our best campaign yet. Inter have not defended their scudetto particularly well, which has left the door wide open for a number of teams to take advantage. Despite a few wobbles, we are most certainly in contention for Serie A glory. You’ll remember from the previous chapter that Patrick Roberts broke his ankle at Carpi, putting him out of action until the spring. That meant I needed to get another wide attacker into the team when the transfer window opened just before the new year began. So I recalled Alexandru Mățan from his loan spell at Empoli. The young Romanian had not enjoyed a great half-season with the mid-table Azzurri, providing just three assists in 16 outings, but I reckon he could come good for us. Alex is an exceptional dribbler who is best-suited to an inside-forward role on the left flank, but he can also play on the right wing. Mățan would feature in the second half of our mid-season friendly. Less than a month after our Champions League campaign ended in Valencian pain, we returned to Spain to face Oviedo – from the Segunda División. A sponsorship deal with Santander means we should officially call that Liga 1|2|3… but I’d rather not. We weren’t convincing, but we got the job done. Sandro Tonali set up the only goal of a dire contest for Dusan Vlahovic, but it was Kevin Diks who impressed most at right-back. I would move on to all our winter transfer business… but I didn’t sign anyone in January. That was partly because I was very happy with my squad, and partly because I didn’t want to be burned on yet another deadline day. Our only departee was teenage striker José Luis Sánchez, who had struggled to make his mark at Fiorentina so far and was loaned out to Frosinone for the rest of the campaign. Indeed, this window would be all about who we didn’t get rid of. Barcelona offered €30million for Almamy Touré, which was half of what I was demanding for our first-choice right-back. His understudy Diks was also staying put, with Swiss champions Young Boys unwilling to up their laughable initial bid of €3.8million. Upsetting your captain is not advisable in most cases, but if I don’t want a particular player to leave, I won’t let them leave. Marco Benassi learnt that last season, and Jordan Veretout the season before. While three players initially agreed that Chiesa should be allowed to move, I changed their minds by stating in no uncertain terms that we could not afford to lose him. As in real-life, a happy team generally performs to – if not above – expectations. One of the keys to success in Football Manager is to keep morale as high as possible for as long as possible, thus minimising the risk of players getting grumpy. As well as getting good results (obviously) and putting in regular team-bonding sessions in training, I find that a well-judged team meeting can do wonders for morale. In case you’re wondering, our other ‘unhappy’ player is Christian Nørgaard. The Danish playmaker didn’t react well to my attempts to sell him over the summer, so I promised him that he could stay for at least one more season. Apart from Chiesa, those players who don’t yet wholeheartedly support me are summer signings. Generally, though, I get on incredibly well with all my players, which in turn helps us to exceed expectations… at least when it comes to domestic competitions. Long may it continue. Despite his hissy-fit over not being allowed to join PSG, Chiesa retained the captaincy when we officially kicked off the second half of the Serie A season. I expected him and our other attackers to have far too much for relegation-threatened Chievo. One had to go all the way back to October to find the Clivensi’s last – and only – win of this league campaign, in which they beat Torino 1-0 at home. Chievo’s Colombian goalkeeper David Ospina was called into action after three minutes, catching Fiorentina compatriot Yesid Gonzalez‘s header from an early Valentin Eysseric corner. Gonzalez’s wait for his maiden Viola goal continued, but it wouldn’t be too long before Eysseric opened the scoring with his first from open play this season. After 19 minutes, Chievo captain Ivan Radovanovic’s free-kick was caught by Alban Lafont, who quickly got it upfield. Vlahovic flicked the clearance out right to Chiesa, who dribbled through acres of space on the wing before crossing to the edge of the six-yard box. Eysseric was there to outjump a couple of yellow shirts to nod the ball in, with a little help from Ospina’s right-hand post. Gonzalez then missed a couple of chances to double our lead before Lafont denied Mijat Gacinovic a Chievo equaliser in the 32nd minute. By half-time, we’d registered one shot on target from 11 attempts in total. Despite Valentin converting that only shot on target, I was not at all happy, and the Viola players got a tongue-lashing before the second half. Chiesa “appeared to switch off” after my criticism of him and his team-mate. If our captain’s idea of switching off is to double our lead 31 seconds after the restart, following an exchange of crosses with Cristiano Biraghi… I don’t mind that! Federico was apparently so great a player that he could tear a team apart without really bothering. He almost doubled his tally with a sublime solo goal in the 53rd minute, during which he shrugged off a challenge from Chievo left-back Federico Ricca before firing just wide. The Clivensi were being overwhelmed, and the loss of attacking midfielder Gacinovic to a groin injury in the 77th minute was devastating. Five minutes later, his replacement Emanuel Vignato gave away a third goal to us. His weak interception of Bernardeschi’s chipped free-kick was picked up by another Fiorentina substitute, and Mățan marked his competitive Viola debut with a tidy finish through a crowded penalty box. Four minutes from the end, we wrapped up a resounding 4-0 win – our biggest of the season. Bernardeschi got the goal his excellent cameo merited, finding space to volley Diks’ right-wing delivery past a helpless Ospina. Udinese weren’t in action, which meant we took 2nd place from them for the time being. Napoli strengthened their lead by seeing off Roma 2-1, while both Milanese clubs only managed 1-1 draws – Inter vs SPAL, and Milan at Lazio. Had we travelled to the Allianz Arena three weeks earlier, we could’ve expected a towelling from Juventus. Marco Rose’s men were on a ten-game winning run in the league and at last looking like the Bianconeri behemoths of old. Then they lost 3-0 at Napoli in the Coppa Italia, before suffering a humiliating 4-0 friendly defeat in Lens. Juve were there for the taking again, and Mario Mandzukic was hungry to get one up on his former employers. Our joint-top scorer this season (alongside Chiesa) could have got his ninth Fiorentina goal after six minutes. Despite getting the better of Juve defender César Azpilicueta in the air, Mandzukic couldn’t quite nod Bernardeschi’s left-wing cross past Wojciech Szczesny. It was an action-packed start to the match for Azpilicueta, who was booked for a trip on Mandzukic in the seventh minute. Three minutes later, he celebrated upon heading Miralem Pjanic’s free-kick into our net from a clearly offside position. Of course, there was no fooling either referee Andrea Bocelli or his assistant Stevie Wonder. Wing-backs enjoyed arguably the best scoring opportunities of an edgy first half. Juventus right-back João Cancelo had a vicious angled effort turned behind by Lafont in the 21st minute. A bit later on, Biraghi – our man on the left – twice tried his luck from just outside and then just inside the area, only to find Szczesny in fine form. Juve’s number 1 wasn’t going to gift us victory, like he did on our last visit here. My only major tactical tweak for the second half was to push our defensive line up a notch. Gonzalo Higuaín and Cristiano Ronaldo might have been goalscoring machines at their peaks, but they were now in their mid-30s, and it showed in their lack of pace. Without much space to exploit, the Argentine and Portuguese aces would be shut out and kept out. The Bianconeri’s defence wasn’t giving our attackers a great deal of room either. Chiesa simply could not get his game going, and after losing focus once more, he was substituted on the hour mark. My counterpart Rose made a major change at around the same time, adding the pacey Bertrand Traoré to his attack. The similarly rapid Moise Kean replaced Higuaín later on, and it was his introduction that got Juve going in the closing stages. A sloppy clearance from Benassi in the 87th minute almost gave Juventus a late winner, but Brazilian attacking midfielder Lucas Paquetá drove it just wide. Lafont then had to save efforts from Kean and Traoré, before Juve left-back Alex Sandro’s final roll of the dice went inches off target. Our winning run might have ended here, but at least we came away from Turin with another precious point. Udinese were comfortable 3-0 winners at home to Lazio, which meant they returned to 2nd place at our expense. Inter were dealt yet another blow in their attempts to get back in the title race, twice letting a lead slip before losing 4-2 at Bologna. Piotr Zielinski secured Napoli a 1-0 win over Genoa to keep them top of the standings. The Pole scored again when the Partenopei visited Atalanta in midweek, but 19-year-old Diallo Amad Traoré struck late on to hold them to a 1-1 draw. Meanwhile, Juventus’ 4-1 away loss against Lazio meant the Bianconeri were now six points behind us in 4th. Before our next match, Chinese Super League champions Shanggang tried to lure a couple of our players to East Asia. The Shanghai club submitted a couple of offers at around the €20-30million mark for Benassi and then Touré, both of which I found to be completely unacceptable. Benassi accepted my reasoning. Meltdown averted. Pescara were having an unremarkable league season, sitting 11th in Serie A. That being said, they still gave us a thorough examination in the first half at the Adriatico. Right-sided midfielder Rachid Ghezzal tested Lafont with a curving shot after just four minutes, while left-winger Arkadiusz Reca got a couple of efforts on target midway through the half. We were rather more erratic, not just with our shooting, but also with our passing. Lowering our tempo a touch helped in that respect, and we started to come good after the half-hour. Mandzukic and Eysseric each had a couple of efforts saved by Pescara goalkeeper Vincenzo Fiorillo in the 31st and 35th minute. Then, after 40 minutes, Delfini striker Valentino Cernaz was accused of bundling Viola defender Daniele Rugani over in the hosts’ penalty area. That gave Mandzukic the opportunity to end his recent goal drought from 12 yards out, which he did with aplomb. His ninth goal of the campaign sent us into the interval 1-0 up, though not before Lafont had to make one more save from Cernaz’s strike partner Rasmus Falk. There were calls for us to be awarded a SECOND penalty in the 52nd minute. Eysseric was hunting down a long ball from Tonali when he was seemingly floored by a sliding tackle from Francesco Zampano. The referee consulted VAR, who ruled that the Pescara right-back had won the ball fairly before knocking it behind for a corner. Emerson would drill that corner long to Antonsen on the edge of the box, but the Dane’s hopeful drive missed the target. The action would quickly switch between halves for much of the second period, with a Pescara attack quickly being followed by a Fiorentina counter. Lafont had to be in top form to deny Cernaz and Falk potential equalisers, while Mandzukic and substitute Veretout unsuccessfully attempted to send us 2-0 up. The match would end on a sour note for Pescara’s Brazilian centre-back Bremer. He had an excellent volley tipped over the bar by Lafont in the 87th minute before twisting his ankle and leaving the pitch early. The Delfini could not find a way through our defence, with Rugani especially excelling as we claimed a third consecutive league clean sheet – and three more points. Despite our victory, Napoli’s lead remained at six points after a 3-1 win over a wobbly Juventus side. Significantly, though, we now had 2nd place outright after Udinese were beaten 2-1 at rock-bottom Frosinone. Was the pressure of being in a title race finally getting to the unfancied Zebrette? Meanwhile, the Milan derby ended with a 3-1 ‘away’ victory for Inter, whose midfielder André Gomes was sent off once again! Somebody tell that man to calm down! Our final match of the month was at home to SPAL – a match we surprisingly lost 1-0 last season. Claudio Ranieri’s side finished that campaign in 8th, but they were struggling to build on that and now sat five places lower. Vlahovic got the nod ahead of Mandzukic when it came to leading Fiorentina’s attack here. Consistency was a real problem for the promising Serbian, who had another outing to forget in the pouring Florentine rain. A miscued header from Touré’s cross in the third minute was a sign of things to come from Vlahovic, who hit the post after Veretout sent him clean through on goal in the 16th. Between the 21st and 27th minutes, SPAL goalkeeper Alfred Gomis made three big saves from three members of our French legion – Eysseric, Belaïd Nemdil and Veretout. The latter wouldn’t be on the pitch for much longer, as Jordan collided with SPAL vice-captain Manuel Lazzari and pulled his groin. Benassi quickly came on as a substitute, but he couldn’t inspire us to take the lead before the half-time interval. Our visitors returned from the break all fired up. Three minutes in, left-winger Danilo Avelar got their first shot on target from a Lazzari corner, forcing Lafont into a catch. Our goalkeeper needed to bail us out again ten minutes later, when Alessandro Rossi intercepted Eysseric’s square pass to an unsteady Nemdil. The SPAL striker tried an ambitious chip over Lafont, but Alban was equal to it. That could have changed the game… but one sensational strike from Benassi in the 63rd minute turned things firmly in our favour. Benassi ran onto a square ball from Nørgaard and then proceeded to strike it low and hard past Gomis from the edge of the penalty arc. We hadn’t scored too many long-rangers, but that was one to savour. Thought Marco’s bullet didn’t win us the game by itself, SPAL effectively lost it in the 75th minute. Fiorentina vice-captain Lucas Tousart was quietly going about his business in the Biancazzurri’s half when he was cut down by a shocking two-footed lunge from Federico Viviani. The fiery former Italy Under-21s midfielder was sent off, and we could now control proceedings. Tousart moved us closer to victory in the 79th minute, providing Emerson with a cross that the left-back hammered home from just outside the penalty area. Two minutes later, we compounded SPAL’s misery with a third goal, as Eysseric got ahead of Lazzari to convert Touré’s right-wing cross. Inter drew 2-2 at home to Lazio, which meant they concluded January in 7th place – and miles adrift of the frontrunners. Juventus might not win the scudetto this season either, though Gonzalo Higuaín’s double against Empoli did keep the Bianconeri ahead of Atalanta and Milan in 4th. 3rd-placed Udinese quickly bounced back from just their third league defeat of the season, beating Genoa 2-0 to push their opponents back into the relegation zone. As for the leaders, Napoli came from behind to save a point at Milan, though their advantage over us had now been cut to four points. Napoli are looking good to claim a league and cup ‘double’, but that could all change in February if we continue our fine form. Come back next time to see if we can break the Partenopei’s hearts in the two-legged Coppa Italia Semi Final. 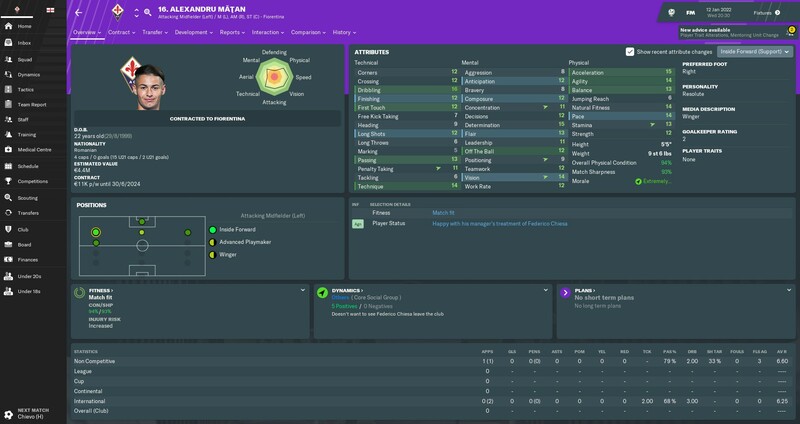 This entry was posted in FM19, Shades of Deep Purple and tagged Fiorentina, FM19, Football Manager 2019 on 9 January 2019 by Chris Fuller.